For some unexplainable reason the orders of "Persue", "Guard Position" and "Hold Position" were removed, and replaced with just a "Hold" order. This is maddening, each of the above orders had specific purposes! You would set units to "Guard" when you wanted them to protect a structure or another unit. This behavior meant that they were to attack any attacker that is in range but NOT pursue them away from what they were guarding. The "Hold" order means just that, don't move from where you are, but you can still attack. The "Persue" order means that when an attacker comes into range, to go after them, and keep going after them. Now, they have eliminated "Guard" and "Persue" for just "Hold" and that is very short sighted. It is turning the game into a dumbed down game that has to strategy left. I strongly feel this move was a very bad one for warzone, and, since it has always worked before as expected, both in campaign and multiplayer that it should be brought back. MODS, can we have a poll on this? Last edited by vexed on 26 Jul 2015, 02:56, edited 1 time in total. 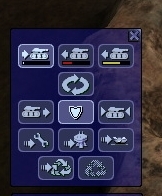 Never used any of these buttons. My units are always on the move during combat (either move, or attack, or attack-position), and when i'm not looking, i'm satisfied with the default behavior. Sometimes i want my units to stop moving, then i just hit 's' and they stop. The reason for their removal is not inexplicable, I think. As the commit referenced in the ticket said, they were removed because they did not work correctly, never did, were very little used (*), and rather than fixing them we should put work into improving primary orders. The whole secondary order system was poorly designed and a mistake, I believe. I suggest to just rename Persue\Guard\Hold > to > Move\Stop\Hold. And dont remove icons from unit menu. "Stop": its like default state that is right now. "Hold": - good-old "hold the ground" state. Basicly its states like in any other normal RTS game. Terminator wrote: I suggest to just rename Persue\Guard\Hold > to > Move\Stop\Hold. And dont remove icons from unit menu. You mean add buttons for primary orders into the secondary order menu? Please replace the all the delete stuff and hold fire ETC. Its a tactical advantage to have all you tanks formed in a spot before you open fire . Per wrote: The reason for their removal is not inexplicable, I think. As the commit referenced in the ticket said, they were removed because they did not work correctly, never did, were very little used (*), and rather than fixing them we should put work into improving primary orders. The whole secondary order system was poorly designed and a mistake, I believe. Hmm, I know quite a few people that actually used those, and I am pretty sure they worked in 1.x and 2.x, don't recall 3.x. By worked, I mean, you would set their state, and it would do what it was supposed to do, and it would also show the state they were currently in. It has to do with playing style it seems, and back when this was first reported by Terminator, in my call for testing master many moons ago, about them going MIA, I thought the plan was to re-implement them as actual orders and then we would reshow the missing buttons, since they showed what state the unit was in. Currently, there is no good way to know without turning on debug mode, and seeing their order/action on a debug line. Each of those (sub)orders have a specific, useful purpose. The hold position order is very important in the campaign. Using the repair units like a repair-fac. And the hold position order is also very important for trucks. Must not explain why. I use the hold position order very often. This "hold position" order doesn`t work as well as before. Repair units now follows damaged tanks. They do have replacements, they are called 'hold' and 'stop', which are primary orders. (We should also eventually have a 'guard' which should be implemented as in any other RTS to mean actually guarding something, ie a primary order with a target.) These new primary orders were added because the old secondary orders were poorly designed. Making units hold, stop and guard should be primary orders, user actions, not unit stances. This is the way it is in any other RTS game I know of. I bet most players never even use secondary orders, because they are complex, unclear and highly cumbersome to use. If you are asking for the old secondary orders to co-exist with the new hold and stop, you are asking for a mess which will be hostile to newcomers to the game. I will be happy with any design that is well designed and does not have duplicated, overlapping functionality, though. 1) "Using the repair units like a repair-fac." 2) "Its a tactical advantage to have all you tanks formed in a spot before you open fire ." 3) The missing buttons to show current state and for ease of use. The 3) above is just an implementation issue. The 1) above should be covered by the hold primary order - if not it should be fixed to do this. The 2) I have no good answer for yet - in most other RTS games moving prevents you from firing, which is how they implement this. Perhaps we need another primary order which is 'move without firing'. Please keep listing use cases where the old system was better, then we can see what we need to do. Per wrote: I bet most players never even use secondary orders, because they are complex, unclear and highly cumbersome to use. waite a minute r y saying that those buttons r secondary orders ? Per wrote: You mean add buttons for primary orders into the secondary order menu? Yes thats what I ment. I didn't know that is a secondary orders menu. For me it is always just a "unit menu" and there are all orders you can give to a unit. I dont think that this will confuse anyone. Per wrote: 2) I have no good answer for yet - in most other RTS games moving prevents you from firing, which is how they implement this. Perhaps we need another primary order which is 'move without firing'. no,no. We have fire states(fire at will\return fire\hold fire) that can be controlled by player. Good player knows hotkeys for that. Right, "Hold Fire", I forgot about that. So 2) is not an issue, either. Yes, we could put buttons for Hold and Stop primary orders in the secondary orders menu (or maybe I should call it 'right click unit menu', since Patrol isn't a secondary order, either, and it is in there), at least as a stopgap measure. Per wrote: They do have replacements, they are called 'hold' and 'stop', which are primary orders. (We should also eventually have a 'guard' which should be implemented as in any other RTS to mean actually guarding something, ie a primary order with a target.) These new primary orders were added because the old secondary orders were poorly designed. Making units hold, stop and guard should be primary orders, user actions, not unit stances. This is the way it is in any other RTS game I know of. I bet most players never even use secondary orders, because they are complex, unclear and highly cumbersome to use. In what way do you see 'Guard Position' or 'Pursue' being anywhere close to either 'Hold' or 'Stop'? Hold Position = hold, don't move from that position. Stop always meant to stop position right there, so 'stop' isn't a new order, WZ always had it. You got me totally confused now. As for being like any other RTS, well, this IS Warzone, something that ISN'T like any other RTS, which is the way we like it. We aren't trying to be like another generic clone of some other RTS. Pursue was always unique to WZ, and I still think that should be returned. You put a unit by a oil resource, and when enemy truck gets close, off it goes to kill it. Guard Position is almost standard these days, 'Hold' and 'Stop' are standard. Perhaps one way to sort this out is to look at what we need in terms of orders and states, rather than getting spun up over terms like primary and secondary, or what was/is. Seems to me we have two main categories: movement orders and behavior orders. Let's call them Movement Orders and Rules of Engagement (ROE). There are also Retreat Orders. I can imagine some Use Cases like Attack, where giving a movement order changes the ROE, but we can get into that later. As for being like other RTS games, let Warzone be Warzone! This game has amazing longevity. We should respect that. vexed wrote: In what way do you see 'Guard Position' or 'Pursue' being anywhere close to either 'Hold' or 'Stop'? At least we agree that the old 'Hold position' secondary order makes no sense now that we have 'Hold' as a primary order, and having it as a primary order is much better - right? The problem with 'Guard position' is that it isn't given anything specific to guard. What is the intuitive behaviour that is expected when a player clicks on this guard behaviour, and later moves the unit? That is not clear. It was also the default behaviour, which makes things even more confusing. Guarding was not something units did other than their default behaviour - it was their default behaviour. So all clicking on 'Guard' did was reset unit behaviour to not be 'Hold Position' or 'Pursue', and the former makes no sense anymore. vexed wrote: As for being like any other RTS, well, this IS Warzone, something that ISN'T like any other RTS, which is the way we like it. We aren't trying to be like another generic clone of some other RTS. Unit stances are far from unique to Warzone, though. It is a fairly well known mechanic, and there are good reasons why RTS games moved away from using them. And while we should 'guard' some of the things that makes Warzone unique, if we refuse to pick up on the lessons learned by newer games we will slide into irrelevancy and just become a dwindling fan club for a dying game. Before shutting down, Pumpkin started experimenting with giving units 'Programs'. This might have been a more promising avenue to go down. Not sure how they would have implemented it, had they finished it, but what I would do is allow the player to hand off units to an AI program. Like with targeting groups, it would immediately leave any unit selections it was a member of, and giving it a primary order would cancel the program. You would in effect tell it to 'do behaviour X until I tell you otherwise' - and just selecting it and click to move somewhere would cancel the behaviour, rather than involving the cumbersome unit menu or memorizing yet another hotkey. It would also be far more clear whether a unit is doing it own thing, or is being controlled by you. I use the 'hold' command when using mortar tanks so I can re-position them, then hold so they fire, then move them again. Also when using a sensor on a tank body so it makes the artillery attack the nearest target, essentially clearing the area that the sensor is in.